A new report focusing on the ways Smart Specialisation (S3) has been applied in the Nordics, with a focus on European Arctic regions, has been published. The task has been carried on by a team of researchers from Nordregio and was commissioned by the European Commission Joint Research Centre and the JRC S3 Platform Team in Seville, Spain. The research analyses the specific context of the Arctic regions, with a focus on the influence smart specialization has had on the attempts to address Arctic challenges. The examples analysed by the Nordregio research team, headed by Senior Research Fellow Jukka Teräs and assisted by Laura Fagerlund and Viktor Salenius, underlined the importance of collaborative effort, presenting a number of good practice cases, where local, cross-regional and cross-border collaboration has helped new projects and initiatives emerge. An important factor emphasized by the study cases and presented in the report is the idea that smart specialisation is able to put in motion regional and local actors. The Arctic regions have proved to be pioneers in applying the S3 approach successfully, by working together and coming up with collective investment solutions. 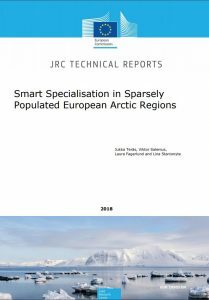 The cases discussed in the report demonstrate that working together and collaborating on joint opportunities is the pathway to establishing and developing long-term smart specialization solutions in the particular area of the European Arctic.